Attach your CLX securely to your CLX Door Anchor. Make sure your attachment is at knee level. Standing in a semi-staggered stance slowly bend your kneed forward and straighten your knee back to starting position. 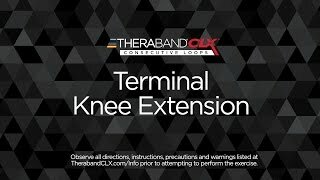 The resistance of the CLX should be harder when you straighten your knee. Hold briefly and return to starting position and repeat. To increase the resistance and intensity, place the Easy Grip Loop at the other end of the CLX around your knee, too.